Antari Fog Machine DJParts - All Variety of Parts that DJ Needs. 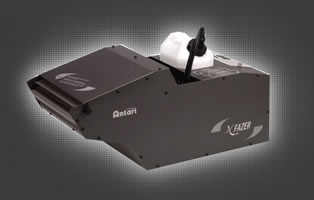 Antari X-310II 1000W Fazer Fog Machine. The versatile X-310II Fazer from Antari is equipped with the most sophisticated features including new technology aluminum cast heater, quiet high quality pump, high precision PCB design and controllable twin fans. The new high efficiency heater technology ensures low fluid consumption of less than one liter per two hours of continuous fogging (30% output). High precision fan control can be achieved thanks to the durable twin fans and the X-20II DMX timer module. The high quality bearings in the fans, allows silent operation, making the machine ideal for use at noise sensitive events. With a small degree of fine-tuning, a perfect haze of fine particles is achievable and minimal residue ensures long term reliability of sensitive lighting equipments. The X310II is a top preference for stage and studio professionals. • Output: 3,500 Cu.Ft / Min. • Heat up Time: 12 Min.